No matter where you are on payday, your entire paycheck can be directly deposited into your Collegedale Credit Union account. To set this up, your employer will need to know your financial institution’s name & routing number, your account number, and what type of account you want it deposited into (savings or checking). Routing numbers are unique identifiers of financial institutions. 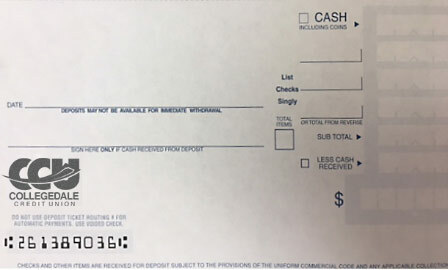 You can find a routing number on the bottom of a deposit slip or check between the colons. On a check, the account number will follow the routing number. Don’t forget the leading zeroes! Ask your employer to find out if you’re eligible, and begin earning dividends immediately on your unused balance. If you desire to discuss Direct Deposit, please call our Member Service Department at 423.396.2101 Ext. 5 or Email us.